Parkin has been producing 3D prints to enhance client communications, providing a tangible product to enhance project development. To familiarize staff with the new technology, the firm has acquired a 3D printer, and posed a 3D design challenge. Phase 1 of the challenge was to encourage development of people’s software and hardware skills. Nineteen participants modelled, reworked and refined their 3D printing designs to fit within a prescribed tight printing timeframe, while exploring unique forms that displayed the 3D printer’s capabilities for detail and form—even when printed in ‘Draft’ mode! 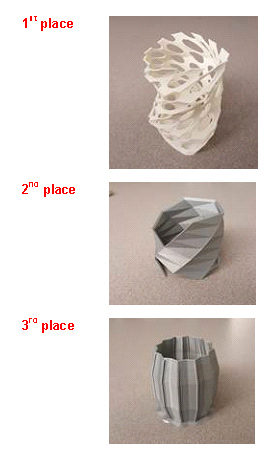 Based on the scoring and challenge criteria, one print scored highest and the others received honourable mentions.